Diode bridge rectifier's circuit is a full-wave rectifier circuit that uses four diodes, and connected as a bridge. 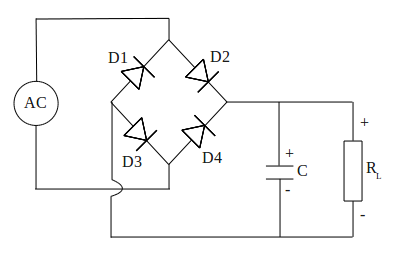 Unlike the full-wave rectifier discussion in previous article, where the circuit uses two diodes, this time is full-wave rectifier circuit with four diodes. Beside different from amounts of diodes, other difference lies in use of a transformer, which transformer used in the bridge rectifier circuit system is not a transformer which has ct (center tap) or using a conventional transformer without ct. Using above circuit with IN4001's what would DC output be ??? ?